This Sunday, the battle over Russia's election year interference. The intel community says the Russians are guilty, case closed. Russia has clearly assumed an even more aggressive cyber posture by increasing cyber espionage operations. President-Elect Trump got an intel briefing on Friday but says he's still not sure. This morning, my sitdown with two Republican senators, Lindsey Graham of South Carolina. If after the briefing he is still unsure, that will shake me to my core about his judgment. And John McCain of Arizona. And if they were able to succeed doing that, then you destroy democracies. Plus, the secretary of Defense, Ash Carter live this morning on what options the U.S. really has to counter Russia. And Obamacare. The Republican party is increasingly divided over how fast to repeal it. Healthcare will be better and less expensive when Obamacare is completely repealed. If there's nothing to replace it with. I think it would not be the right path for us to repeal Obamacare without laying out a path forward. Joining me this morning for insight and analysis are David Brooks, columnist for The New York Times, Andrea Mitchell of NBC News, CNBC's Rick Santelli, and former Congresswoman Donna Edwards. Welcome to Sunday, it's Meet the Press. Good Sunday morning. If there's one thing Donald Trump as candidate and president-elect has been consistent about, it's that Russia in no way interfered with the U.S. presidential election. From arguing in a debate that the hacking of the D.N.C. could just as easily have come from someone who's 400 pounds, sitting on his bed, to trashing the national intelligence agencies, to appearing to side with WikiLeaks founder Julian Assange, Donald Trump has pushed back hard against the idea of Russian involvement. Now he has more to push back against. On Thursday, the heads of the nation's top intelligence agencies and senators from both parties made their conclusions clear. Russia interfered with the presidential election. On Friday, those same intelligence agencies released a report that included this line, "Putin and the Russian government aspired to help President-Elect Trump's election chances when possible by discrediting Secretary Clinton and publicly contrasting her unfavorably to him." Now this public report did not include the sources and methods of how the intel agencies came to these conclusions. That portion is classified. But that was part of Mr. Trump's briefing on Friday. Publicly, the president-elect reacted by neither accepting nor rejecting the findings. Intelligence stated very strongly there was absolutely no evidence that the hacking affected the election results. "Voting machines not touched," the president-elect tweeted. In fact, no one though is suggesting that voting machines were impacted. So the president-elect still appears to be largely on his own, at least within his party, in this dispute. Donald Trump is calling the controversy over Russian interference during the presidential election a political witch hunt, putting himself at odds with the intelligence community. I think there's a difference between skepticism and disparagement. He's at odds with members of his own party. Every American should be alarmed by Russia's attacks on our nation. And he's even at odds with the outgoing president. We have to remind ourselves we're on the same team. Vladimir Putin's not on our team. After an intelligence briefing on Friday, Trump dialed down his outrage in a longer statement, saying instead he has tremendous respect for the intelligence community. But Trump also conflated Russia with China, other countries, outside groups, and people that have waged cyber attacks on the United States. On Friday, the intelligence community released a report publicly concluding that Russian President Vladimir Putin ordered an influence campaign aimed at the United States presidential election. Quote, "Russia's goals were to undermine public faith in the U.S. democratic process, denigrate Secretary Clinton, and harm her electability and potential presidency. We further assess Putin and the Russian government developed a clear preference for President-Elect Trump." The intelligence agencies also concluded with high confidence that Russia's military intelligence arm passed on material it acquired from the D.N.C. and Democratic officials to WikiLeaks and other sites. For Trump, promoting that WikiLeaks material became a campaign staple. WikiLeaks just came out with a new one. They've got it all down, folks. WikiLeaks. They were just announcing new WikiLeaks, and I wanted to stay there, but I didn't want to keep you waiting. I didn't want to keep you waiting. Let me run back into the plane and find out. A senior U.S. intelligence official tells NBC News that U.S. intercepts picked up senior Russian officials celebrating Trump's victory. The report did not address whether the Russian campaign actually tipped the election to Trump. But for a candidate defined by shifting policy stances, Trump has been remarkably consistent on his ambivalence about Russian involvement. I don't think anybody knows it was Russia that broke into the D.N.C. She's saying, "Russia, Russia, Russia." But also could be somebody sitting on their bed that weighs 400 pounds, okay? They have no idea if it's Russia or China or somebody. It could be somebody sitting in a bed someplace. Do you doubt 17 military and civilian agencies? Our country has no idea. Yeah, I doubt it, I doubt it. On Friday, as Mr. Trump was being briefed, I sat down with two Republican senators who have been critical of President-Elect Trump on all things Russia, John McCain and Lindsey Graham, just one day after McCain held the first congressional hearing on Russian interference in 2017. And I began by asking the both of them about Mr. Trump's claim Friday morning, that what we're seeing is nothing more than a political witch hunt. I believe our intelligence leaders, General Clapper and Admiral Rogers who testified before the Armed Services Committee are credible people and well respected. General Clapper I think had 53 years of experience in the intelligence business. And yes, intelligence authorities have made mistakes in the past and have been wrong in the past. But what they're saying is there's a long history of Russian attempts to affect the outcome of our election. You know, here's the deal for me. I think he's worried that inquiring into what Russia did in the election is going to undermine his credibility and his legitimacy. Quite frankly, I haven't heard any Democrat at all of prominence say that we doubt that Donald Trump won. Putin's not the reason that Clinton lost and Trump won. I don't think anybody's saying that. So Mr. President-elect, that's not what we're trying to do. What we're trying to do is find out what the Russians did in our elections and make sure that other people including the Russians won't do it next time. No doubt in my mind that Russians interfered, that John Podesta's emails were hacked by the Russians, not some 14-year-old kid or 300-pound guy, and that the DNC was compromised by the Russians. And it seems pretty clear to me that WikiLeaks got it from the Russians. It didn't affect the outcome, but they tried to interfere in our election. So what I-- he's going to be the defender of the free world here pretty soon. In a couple weeks, Donald Trump will be the defender of the free world and democracy. You should let everybody know in America, Republicans and Democrats, that you're going to make Russia pay a price for trying to interfere. Even though it didn't affect the outcome, they tried to interfere. And they need to pay a price. And I don't care what their motives were. Why do you think he continues to question intelligence on this? Yeah, I really-- because he said, "It's time to move on." Remember when he was asked about, you know, I think maybe on New Year's Eve? "You know, let's just get on with our lives." Here's my retort to that. Our lives are built around the idea that we're free people. That we go to the ballot box. That we, you know, have political contests outside of foreign interference. You can't go on with your life as a democracy when a foreign entity is trying to compromise the election process. So Mr. President-elect, it is very important that you show leadership here. Let me say this: if after having been briefed by our intelligence leaders, Donald Trump is still unsure as to what the Russians did, that would be incredibly unnerving to me because the evidence is overwhelming. All I'm asking him is to acknowledge that Russia interfered, and push back. It could be Iran next time. It could be China. It was Democrats today. It could be Republicans in the next election. I want to get to The Washington Post has a part of this intelligence assessment that says that one of the reasons they know this that they intercepted some communications with Russian officials that were essentially celebrating the Trump victory. What does that tell you? I think you could only draw the conclusion if they were celebrating that they obviously wanted the outcome to be what it was. And then the question is, "What did they do to try to achieve that outcome?" And it's pretty obvious that they were heavily engaged. And we need to come to grips with it and get to the bottom of it and overall come up with a strategy in this new form of warfare that can basically dismantle our-- harm our economy, harm our elections, harm our national security. I would like to see a select committee. Apparently that is not in agreement by our leadership. So we will move forward with the Armed Services Committee and I'm sure Foreign Relations and Intelligence Committee will as well. But it is possible if enough information comes out, that that decision could be reversed. I still think it's the best way to attack the issue. And just we don't know about it? I believe that it's happening. But you need to talk to them because I don't want to speak for them. Here's what I think we should do as a nation. We should all, Republicans, Democrats, condemn Russia for what they did. To my Republican friends who are gleeful, you're making a huge mistake. When WikiLeaks released information during the Bush years about the Iraq war that was embarrassing to the administration, that put our troops at risk, most Democrats condemned it. Some celebrated it. Most Republicans are condemning what Russia did. And to those who are gleeful about it, you're a political hack. You're not a Republican. You're not a patriot. If this is not about us, then I'll never know what will be about us. Because when one party is compromised, all of us are compromised. And here's what I'm going to do with Senator McCain. We're going to introduce sanctions that are bipartisan, that go beyond the sanctions we have today against Russia, that will hit them in the financial sector and the energy sector where they're the weakest. And we're going to give President Trump an opportunity to make Russia pay a price for interfering in our election so it will deter others in the future. I hope he will take advantage of it. I'm going to play devil's advocate here. What about what some Trump supporters might say, Senator McCain. "Hey, we spy on Russia. Russia spies on us." We've done some-- supported democracy movements in Russia actively so. Isn't that a form of getting involved in their politics? How is this not the same thing? It isn't just elections that they are hacking into. It is across the board, including military secrets that we have, including the ability to shut down satellites, including the ability to shut down power plants. I mean, they can do grave danger to the United States of America. We never tried to do anything like that. You guys just returned from a trip to Eastern Europe, spending some time in the Baltic countries. What would you say to Donald Trump. He seems to have an affinity for Putin. He seems to want to have a reset with him. After your visit with Eastern Europe, do you think a reset with Putin is something that's worth doing? They have slaughtered Ukrainians. They have dismembered a country. And I don't think they are through. And they've done so in violation of all international norms of behavior. And they're putting strains on the post-World War II new world order, the likes of which we've never seen. Here's what we told them, our voices are going to be lent to their cause in two ways. I want a one/two punch against Russia. I want more sanctions to hit him harder, to deter what he did in our election and what he's doing throughout the world, Putin. Secondly, I want to help the Baltic States, Ukraine, and Georgia more. We want more trainers on the ground, 365 days a year, a permanent U.S. military training presence in the Baltics, Ukraine, and Georgia. Would you be more comfortable today if Hillary Clinton were preparing to be president as far as national security is concerned, Senator McCain? No. I don't think much about that because of the result of the election. But I thought some of the things that were revealed in the WikiLeaks were very disturbing as well. And the server and the statements about Benghazi. So no, I think I'm not sure it would be better. And where are you on this? Well, I want President Trump to be a good president. I like the fact that he wants to get a better deal with the Iranians. I like the fact that he wants to cut taxes and secure our border. There's a lot of things I agree with Donald Trump on. I want to help him where I can. And I feel an obligation to say no where I must. Right now, the biggest problem I have with what I see coming out of the president-elect's team is Russia. I'm hoping that after he gets the briefing from the finest among us that there is zero doubt the Russians did this. Nobody's saying that you didn't win the election, Mr. Trump, President-elect Trump. That's not the issue. I hope you will embrace the intelligence, you will join the Republicans and Democrats to push back against Russia to make sure this stops and doesn't happen again. If after the briefing he is still unsure, that will shake me to my core about his judgment. I'm going to wrap up with a question that has nothing to do with this. President Obama's going to be giving his farewell address. Positive-- The most positive part of his legacy, most negative part of his legacy. I'll start with you Senator McCain. I would say the most positive part of his legacy is that the very fact that the first African American as president of the United States is a signal that in America anybody can rise to the highest level. And I think that that's a very important landmark and is historic. I would argue that his worst is his handling of national security particularly in the Middle East. And that the red line over Syrian use of chemical weapons, that sent-- when he went back on that, it sent a message that reverberated throughout the world. Where are you? Positive and negative. He and the First Lady need to be complimented for representing our nation well as a first family. It’s not-- Like Senator McCain says, it's historic. He's the first African American president. But it just wasn't that. I think the family represented us in a fashion we can all be proud of. As to policy, I think he's going to be remembered for taking America from a position of strength to a position of weakness. That on his watch he was a very poor adversary for evil and even worse defender of democracy. It's true. And it's sad. It's not what I want to say. But tell me how you can come to any other conclusion. All I can say is his foreign policy has been a miserable failure. He's been weak to his core when it comes to representing American values. And that is what I believe. And I hope Donald Trump will make it better. We've had eight years of weak. I don't want four more years of it. I hope he'll turn this around. And when it comes Russia, he's on the wrong path. When we come back, incoming White House counselor to President-Elect Trump Kellyanne Conway responds to Senators McCain and Graham. And later, Republicans say they want to repeal and replace Obamacare. They've got the repeal part down now. But replacing is proving to be a bit more difficult. So, now what? Stay with us. Welcome back. Panel is here, Rick Santelli of CNBC, former Democratic Congresswoman Donna Edwards, NBC News's chief foreign affairs correspondent, my friend, Andrea Mitchell, and New York Times columnist David Brooks, welcome all. Happy new year to you. Before I get to you guys, I want to share this, this morning I spoke to Kellyanne Conway. She of course is now the counselor to President-Elect Trump in the new White House. And I asked her if Donald Trump accepts the conclusions from the intelligence community on Russia's election interference. Here's her response to me. In terms of Russia, if the report says that they attempted, I read even The New York Times stories, they're saying they "aspired to" and they "attempted." They did not succeed. They did not succeed to embarrassing this country on the world stage. They did not succeed in throwing the election to Donald Trump. That's very clear in this report. And I don't want your viewers to be left with any other impression. Read The New York Times outtakes, read The Washington Post, read the report itself. There is no evidence that Russia succeeded in any alleged attempt to disrupt our democracy or in fact to influence the election results. He wants to pursue better relations with Russia even staring at this report that says Russia was trying to disrupt our democracy. Does he believe he can do both? He has said yes. In other words, it really depends on the issues. So he will punish Russia on this? He does plan to punish Russia on this? No, I didn't say that. I told you earlier and I'll repeat it now. He's not the president yet. All of you insist, one president at a time. So okay, one president at a time. When he becomes president, after January 20th, and he meets with his security and intelligence team, he, as President Trump, will make a decision on what to do. Okay, guys. I heard one piece of news there from Kellyanne, Andrea, I wonder if you heard the same thing, which is okay, there seems to be a tacit acceptance of the intelligence community conclusions that Russia attempted to disrupt. And so I feel as if they have moved a little bit. Well, she has. Not the president-elect in his tweets about this, because he lumped Russia, China, all the other bad actors on cyber attacks, which we've known about in the past. This was a report in an investigation into Russia. And it was not an investigation into whether they succeeded. The very attempt is the issue. And it's not just cyber. It's the propaganda war, it's fake news, it's R.T., the official Russian television network that has some connections in the past, in fact, with Michael Flynn, the incoming national security advisor. So there are profound questions here. And this was a devastating attack and attempt. And whether or not they succeeded is not the issue. Changing the subject is not the issue. The attempt itself is what was being punished. David, what do you have? This thing is happening on two levels. The first level is the gravitational pull of Donald Trump's ego, which is like Jupiter coming through the solar system, around which everything must revolve. And he cannot admit that he won this election with anybody else's help. And so he just wants to say, "It's me, it's me." But to me, the more important thing is a shift in strategies that I think a lot of people in this Trump administration, Steve Bannon, and others want to do, which is all through all our lifetimes, Republicans, Democrats have basically supported the post World War II international order and seen Russia, or the Soviet Union, as a threat to that. Bannon and others in the international tea party movement do not support that order. They see Russia as a potential ally of nationalist populists against Islam. And that would be a fundamental shift in American foreign policy if we're more pro Russia than we are pro NATO. And to me, one of the interesting things in this whole administration will be Bannon versus Trump. That is to say a guy with the ideology versus a guy with no attention span who sees a lot of shiny objects. Rick, what do you make of that? You know, if Hillary didn't have her email problem, and we didn't go back to 2009 and see whether it was Lindsey Graham or John McCain make a bigger issue out of all the hacking that was going on, when Target gets hacked, I don't hear people saying, "Hey, was it Kohl's, was it Wal-Mart?" It doesn't matter. There was a hack, you deal with it. I think that what's going on here is really so politically driven. It doesn't matter who did what when. Working with Russia, we worked with Iran. Are they our friends? You have to take each situation uniquely. Listen, the president-elect has a boatload of issues. I agree with the pull of his ego. But I think that the media in general is just being quite unfair here. Wait, why is the media an issue? Why is the media an issue? This is the intelligence community. Okay, it's intelligence. Where was all of this when the D.N.C. was hacked in June? See, this wasn't made an issue. Because it would have put the emails and Hillary's server right in the middle in the thick of it. That's why this went under the radar screen. This is all tied together. Why wasn’t this investigated long ago? Let me finish. With the Russian interference in this election. I don't agree with Kellyanne Conway. I actually do think that the Russians got what they wanted. They interfered, they are creating this chaos, we are two weeks outside of an inauguration. And we have chaos around what happened during an election process. So I think that there was success. And I think the president-elect needs to not just move from accepting that there was an attempt, but to really going after the Russians because here it’s the election, the next time it's another election. Maybe it's the Republicans. Maybe it's our economic system. And we have to treat this seriously. And the president-elect needs to get out of campaign mode and get into governing. Putin is a guy who murders journalists, who's destroyed the democratic process in his own country, and now suddenly he feels the freedom to try to do that in our country. I don’t know-- It’s not normal statecraft. --to see Russia is happy because Trump won on election night, I never saw you so unhappy. You picked sides, everybody picked sides. Let's get back to the facts here. Here are the facts. We've been seeing entities-- we were hacking Merkel's phone. Everybody does it. How long has Wikileaks been out? Let me finish my sentence. WikiLeaks was out from the end of the summer and it was being investigated. Whoa whoa whoa. There were plenty of headlines. There was no proof of who did it. People in charge of intelligence are political as well here. They did it in Ukraine. They're doing it in Germany now. They're doing it in Germany right now. This is really serious. And we're not going to get over it by just saying, "Everybody does it." Right, we should be solving the problem instead of making it a political hot potato. When we see the Cuban missiles on the island picture, Trump needs to see it, the four networks need to see it. Oh, the hearings. You know what? There's hearings on everything, they're kabuki theater. I'm going to pause this conversation. We will come back. But when I come back, I'm first going to have a conversation with the outgoing secretary of Defense Ash Carter. He joins me here. I'll ask him what could the United States do to retaliate against Russia. Welcome back. There are few people who are better positioned to know what options the United States has at its disposal to retaliate against the Russians for the election interference. So my next guest, Ash Carter, has been President Obama's secretary of Defense for the past two years. And he's watched as we've moved from a hopeful Russian reset to Russian aggression in Ukraine, Crimea, Syria, and now of course, the 2016 interference issue. Secretary Carter joins me now. Welcome to Meet the Press, sir. Good to be here, Chuck. Let me start with something Senator McCain said on Thursday after his hearing. He called this interference an act of war. Do you agree? Well, whatever you call it, it's an aggressive act against our very democracy. And that's why I think all Americans need to regard it very seriously. The intelligence community came to that judgment, they reported that out this week. They obviously did a very careful job, painstaking job, given the nature of it, which is cyber. And that's the conclusion they came to. And it raises questions about our overall strategy with respect to Russia. Okay. But let me go to does it require, what kind of response, or retaliation does it require? Do you believe it's a military response? Many people do not believe it should be a cyber response. I think we should not limit ourselves when cyber is the means used to commit aggression against this to a cyber response. That part is right. I don't think it should be a military or purely military response. There has to be a response. And I think the things, the steps that have been taken so far probably represent a beginning and not the end, a floor, not the ceiling. Obviously being up to the next administration and the next Congress to take those steps. But I suppose--I believe there will be more, there probably should be more. Do you accept the criticism that this administration's moved too slowly to punish the Russians? Well, the intelligence community, I can't speak for the F.B.I. or the national intelligence community. They obviously did a very careful job, they took the time that it required them to become certain about this conclusion. But now it is what it is. They're very clear, they're very unequivocal about the judgment. And I think the seriousness of the issue is one that all Americans need to take very seriously. President-elect, while he's dialed back his criticism of the intelligence community, he still, as of yesterday, said he wants to pursue a good relationship with Russia, to even tweeting, "Having a good relationship with Russia is a good thing, not a bad thing, only," and he put this in quotes, "stupid people or fools would think that is bad." Can the United States continue to have a compartmentalized relationship with Russia anymore under this circumstance, which is what you pursued for a long time? Well, I wouldn't say compartmentalized, but we do have to have what I'll call a strong, but also a balanced approach to Russia. You know, Chuck, I'll be leaving the Pentagon next Thursday. I first walked in there 35 years ago. It was the peak of the Cold War. And at that time, we had serious problems with Moscow, as we do now. And even then, we always tried wherever possible to find common ground with Russia and work with it then. I did that after the wall came down. And worked with Russia and the Russian military very, very effectively, very cooperatively. What's become difficult in recent years is that Russia, under Putin, has tended to define its interests as being ones of frustrating the United States rather than pursuing its own interests. They're pursuing their own interests, we can look at their interests and our interests and try to find common interests and cooperate. So we need a strong policy of countering Russia, but also a balanced one where we try to work with them where we can. Has Russia been an ally in this renewed effort to get rid of ISIS out of Syria and Iraq? Would you call them an ally? --and you mean anything. Would you put it at zero? Virtually zero. They came in, they said they were going to fight ISIL, and they said they were going to help in the civil war in Syria. They haven't done either of those things. And as a consequence, of course, we're fighting ISIL ourselves, we have a campaign plan that you see unfolded in Mosul today and Raqqa today, encouraged, that's going exactly according to the plan we laid out about a year ago. In fact, Iraqi security forces are approaching the Tigris River as we speak today. Secretary Kerry, in essentially an exit interview of sorts with my colleague Andrea Mitchell seemed to say that whatever the red-line decision by President Obama on Syria, however, however folks want to interpret it now, got interpreted as something was going to happen. And then when nothing happened, it created this vacuum. Do you--do you tend to agree with that premise? But has it made your job harder? Would the Russians be there if it wasn’t-- if the United States hadn't enforced the red line? I can't say that. I think the Russians saw an opportunity there to play a role which could have been fine. Because what they said they were going to do, which they could uniquely do, is help Assad move aside gently, bring the moderate opposition into the Syrian government, and put an end to the terrible tragedy there. That's what they said they were going to do. That would have been okay. That's not what they've done. They've doubled down on the Syrian civil war. I'm going to ask you about something, it's related, there was an op-ed this week by one of your predecessors, Former Secretary of Defense Bill Perry. He's very concerned about this idea of essentially some sort of nuclear bomb that's used somewhere, anywhere, that this is a crisis that we're not paying enough attention to. You co-wrote an op-ed with him ten years ago, advocating that maybe there should be preemptive action against North Korea. North Korea seems to be what everyone's concerned about. That you would have supported an avocation of preemptive strike against North Korea on nuclear facilities. Would you advocate that now, ten years later? That was a different circumstance then. But with respect to North Korea today, that's absolutely right. Their nuclear weapons and ballistic missile defense programs are a serious threat to us. We try to stay ahead of that and we are staying ahead of that with our missile defenses to make sure we've upgraded their number, their type, so that we're sure we can defend ourselves. We've deployed missile defenses in South Korea, Japan, Guam, and of course, we have 28,500 troops there today, Chuck. And we do every day, their slogan is, "Fight tonight." We're ready to defend the Korean peninsula and defend our friends and interests there. So in the Defense Department, our job is to stay one step ahead of the North Koreans. Is it policy now that if they test an intermediate-range ballistic missile, the United States would shoot it down? If it were coming--if it were threatening to us, yes. That is, if it's predicted impact or one of our friends or allies, yes, we would shoot it down. What about a test into the ocean? Is that something we would shoot down? We only are would shoot them down, and that is use an interceptive for that purpose, if it was threatening. That is, if it were coming towards our territory or the territory of our friends and allies. All right. Before we leave here, I want to ask you about the tragedy that happened at Fort Lauderdale. The gunman appears, the family believes, there's some sort of trauma he received while serving overseas. Obviously this issue of P.T.S.D. is something that is concerned of a lot of our leaders in the military. Do you worry that maybe the military, the National Guard just doesn't have the ability to find these mental health problems with veterans as they get discharged soon enough? This particular case. But P.T.S.D. and so-called uninvisible wounds of war, something that we do take seriously, we have to take seriously. We owe to our wounded warriors 15 years now, including today, and one of the most serious things I do is send signed deployment orders and execute orders that send people into harm's way. So it matters a great deal to me that we take care of wounded warriors. And the mental wounds are very real. And you think we've done enough? No we keep learning more about how to deal with this kind of illness, we're going to learn more, and we need to do more as we learn more. Absolutely. We owe it to these people. Ash Carter, I have to leave it there, unfortunately for time. Thank you for your service to the country. Thanks, appreciate it, appreciate being here. Back in a moment with the very real perils for Republicans, if they can't figure out the replace part of Obamacare, repeal and replace that equation. The repeal they got down. What about the replace? And then Rupert Murdoch's New York Post, no friend of Democrat is urging Hillary Clinton to run again for mayor of New York City. Do they want her to make history or are they making some trouble? We'll be right back. And we are back. It's Data Download time. For years now, Republicans have been talking about repealing and replacing Obamacare. But there's been a lot more emphasis this week on "replace" than we've heard in the past. More than 20 million Americans now have health insurance through the Affordable Care Act. And data from Gallup, analyzed by my colleague Dante Chinni, our data guru here at NBC, indicate that many of those people live in counties that voted for Donald Trump -- in a big league way. Let's start with Grundy County, Iowa, a rural county in middle America. It's seen a 50-percent drop in those without health insurance since President Obama was elected through 2014. That's well above the national average: roughly a 20 percentage percent drop. It's also a county that voted for Donald Trump by a whopping 39-point margin in November. And this is a pattern that holds across other kinds of counties that were Trump strongholds as well. There's sparsely populated, aging community Luce County, Michigan, which has seen a 33-percentage point drop in the uninsured. Luce County voted for Trump by a 42-point margin. Finally, let’s look at working class Vinton County, Ohio, where the uninsured rate has dropped 28-percentage points in recent years. The same county voted for Donald Trump by a whopping fifty, 5-0 points. Politically, the Republican party has no choice but to symbolically repeal Obamacare, as fast as they feasibly can. A campaign promise it's been making for 6 years. But a lot of voters -- Democrats and Republicans -- could end up losing their health care if Republicans don't figure out the replace side of the equation. When we come back, how exactly do Republicans plan to replace Obamacare? Well, more and more of them are concerned the repeal is moving too fast. We'll look at the challenge just ahead. Welcome back. We're starting to see something of a sea change in how Republicans are talking about repealing and replacing Obamacare, now that the G.O.P. controls the House and the Senate and the White House. The promise that they've been making to voters to repeal the law shouldn't be all that difficult. But this week, the growing course of Republicans are insisting that a repeal won't be successful without the replacement plan ready to go at the same time. I think it's imperative that Republicans do a replacement simultaneous to repeal. If they don't, Obamacare continues to unravel. During the campaign, he said that the repeal and replacement should take place simultaneously, okay? That to me is the prudent course of action. Kicking the can down the road for a year or two years is not going to make it any easier to solve. Panel is back. The healthcare wars. Rick? Let me ask you, you see, it's one thing to campaign, now they've got to govern. Where are you? Well, I think the repeal, obviously we probably all agree on, is going to happen. I think on the replace, the issue I have, is if you have insurance right now, just because the replace doesn't come immediately when they pull the straw out to repeal doesn't mean you're not going to have insurance. And many out there don't understand that. And I think the big issue is this is Donald Trump's test. He's a deal maker. He's already visited many of the players, and I think that this is where his skill lies. I think he's going to make deals. And I think competition is the biggest thing he's going to bring to the table. You know, it's interesting, and why I'm glad we led this segment also with the data download, which shows, look, many of his constituents, they're not going to accept just a repeal here. They want that--they want that replacement. I mean, the big problem that a lot of conservative Republicans in the freedom caucus and other places are concerned about is the billions of dollars in tax revenues. If you repeal, you lose the money that finances a lot of this. And they're losing that money already. So this is going to be a big problem. They don't want to blow a hole in the budget deficit. If they can delay the implementation, they can play around with the implementation dates, but they've got a real problem with the tax deficit. Now I want to underscore something Rick said, by the way, which is this phase in, it took three years to phase in Obamacare, it's going to take, but it's seeing the plan immediately, I think is what is the concern. Policy signed today will be in place. Will the coverage be as good? Maybe it will be less. That’s been the hallmark of this plan. The base of this system is an insurance-based system. There are ideas that were built from Republican ideas, Mitt Romney in Massachusetts. And the fact is that Republicans know that their replacement has to include some of these elements and so I think the honest thing to do for Republicans is to repeal it and replace it. And if they had had a replacement, we'd have it by now. Yeah, I think what's going to be interesting is will there be a dynamic where Chuck Schumer and Donald Trump forge an alliance here to come up with some sort of compromise? Well, if Donald Trump keeps-- If Donald Trump keeps tweeting that he's a clown, perhaps not. Not the best way to go into this, as a deal maker, allegedly. --how would that compare with the rates you get today? I think many agree, being on the plan till 26, good idea, preexisting conditions, they all have a cost. So you have to find a way to pay for it. But it doesn't mean that you're going to keep or change. Listen, cars have tires. You can reinvent the car, but it's still going to have tires. Those aspects are components of healthcare. I think that's a silly analogy. They have-- I think Republicans have to guarantee people can keep what they've got right now, or it's political suicide. Well, we learned that, right? I was just going to say. You mean if you say, “Do you want your plan, you can keep it,” that’s bad politics? It was political suicide for the Democrats. The wonky thing to say is the Republicans can change the budgetary aspects of this with a narrow vote, they can't change everything without a much higher political hurdle. And that's just going to be very tough to get. All I have to say is Democrats made a mistake when they didn't bring Republicans into this process, and they owned it on their own, and it was a political problem. Republicans are going to make a mistake if they own this on their own. I mean, if this is a partisan effort on the other side, then we're going to continue to litigate. I think there's going to be a big compromise. I think you're going to be impressed. Well, I think we all want to see compromise once somewhere. I have one compromise here, let's take a break. That we'll all agree on. 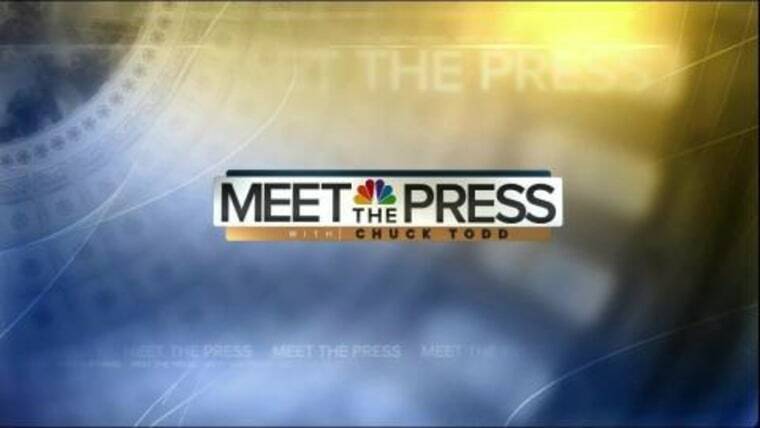 By the way, I want to remind everybody that Meet the Press has expanded. We have a podcast. We call it 1947, that's the year our broadcast was born, by the way. So far on the podcast, I've talked to Andrew Sullivan, Chris Fowler, yes,of ESPN's Chris Fowler, Doris Kearns-Goodwin, just to name a few folks. I'm going to have a lot more of interesting guests lined up. You can find us on iTunes and the Apple podcast app, you know, that purple thing. Just smash it on your iPhone. When we come back in 45 seconds, our endgame segment, and the game that perhaps The New York Post seems to be playing with Hillary Clinton saying, "It's time for her to run again." For mayor. We'll be right back. Here's what's going on, I think. I mean, The New York Post hates Bill De Blasio, and no love lost there, they're stirring the pot, they're making mischief. No comment from team Clinton. She's coming, by the way, for the first time back to Washington, well, to actually speak. She's coming to the State Department to dedicate a memorial wall on Tuesday night. But the bottom line is that this could be a trial balloon, no one is saying it isn't. But boy, it would be a terrible idea. --who took forever to endorse her. And it's a little political needling. Does New York City need Mayor Hillary Clinton? You know, being from Chicago and looking at our history of mayors, I never weigh in on which direction it goes or how it turns out, to be quite frank. Because you know what, they're not going to pick up your garbage if you weigh in the wrong way. I just want her to have fun. You know, she can be Celebrity Apprentice, apparently that's not working out, Redskins coach, Paul Simon roadie, there's a lot of good jobs she can have. Yeah, Donna Edwards, what would you tell her to do? I'm going to invite her to come and join me on my R.V. road trip around the country. There you go. I think that would be good. You brought up Celebrity Apprentice. Donald Trump and Arnold Schwarzenegger, and yes, okay, before viewers all start yelling at me, "Oh, NBC has a conflict on int--” okay, it's on NBC entertainment. But clearly, Trump tweets about ratings at Arnold, has a little fun with him saying, "You didn't have a great--" well, Arnold tweeted right back. First here's Trump, "Wow, the ratings are in and Arnold Schwarzenegger got swamped or destroyed by comparison to the ratings machine, D.J.T.” Oh well. Well, Arnold responded, "I wish you the best of luck, and I hope you'll work for all of the American people as aggressively as you've worked for your ratings." Here's the weird thing, Rick Santelli, Donald Trump's an executive producer of this show. Why trash your own show? And how about doing it two hours before you're getting the intelligence briefing on Russia? What about the dissonance there? Finally he's tweeting on something he has some expertise on. --Donna. But in all honesty, it's funny, this was the week, David Brooks, that I thought Donald Trump said, "I'm just going to tweet when I want." This was-- his tweeting habit this week felt like the September Donald Trump. It was interesting. And boy, when you have the incoming White House press secretary saying, "I don't know what he's tweeting until after I see it on Twitter," that's tough. But it didn't go away as far as the allies, the adversaries. The rest of the world is reading this stuff. But they too have to acknowledge, these things come out of his mind, and then they go off into the wind. He’s not a normal president of the United States. You know, it's interesting with the tweets this week, there were three automakers, Rick, that he hit. You came out hard against President Obama overall, you don't like government interference in the economy. When is it too much for you? When does Donald Trump do this too much for your taste? When it doesn't benefit the U.S. economy. I think as president-elect, he's restricted on how involved he can get. I like free markets, but I do like fair markets. And there's a gray there. We need to see how the gray turns out. There's going to be tax policy changes, most likely, and regulatory rollbacks most likely, which are going to change the scale of how businesses operate that aren't domicile in this country, selling products here. Maybe he's giving them a head's up. Well, I was told in fact that the Ford CEO got so many calls, eight or nine separate calls from Donald Trump about trying to shut down other overseas operations. So they finally came up with this small piece of it. But that's the kind of pressure we've seen on Boeing and Lockheed Martin. It does raise issues. The other piece that we haven't talked about is the ethics issues that have not been addressed and we’re going into these hearings. We're going to see a lot of them this week. But that's all I have for today. Because it's an important Sunday. We'll be back next week, because if it's Sunday, it's Meet the Press. And next Sunday, it also better be Packers/Cowboys. Big shout out to the viewer who sent this, you will always get love from me. We'll see you next week.